TD Book Week 2018 Begins Today! 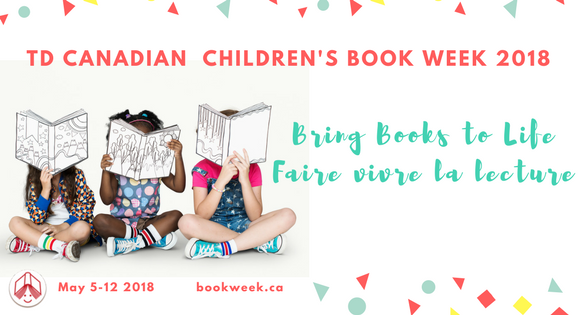 We couldn’t be more excited for the start of #TDBookWeek 2018! With 28 creators touring across Canada to share their love of Canadian children’s books, the week is going to be full of excitement and will certainly be unforgettable for the creators and everyone they visit on their tours. Are you wondering what you can you do to celebrate Book Week? Find our if there are public events near you through our event page. Purchase a poster and bookmarks for your classroom or library. Posters are $5.95 each and bookmarks are $4.95 for sets of 30. Learn more about the creation of the official Book Week poster and about illustrator Gabrielle Grimard here. Get to know the touring creators through short interviews with all 28. Read part one, part two, part three, part four and part five. Follow the creators on their journeys by following them on social media. Find the touring creators’ books through our theme guide. Enter our contest to win a poster, bookmarks, magazine subscriptions and 17 books by the touring creators! Enter through Facebook here and read more about the contest here. ENDS WEDNESDAY MAY 9 AT 10AM! Follow the Book Centre on social media to stay up to date: find us on Twitter, Facebook and Instagram. Check BookWeek.ca for updates from the touring creators.